2.1 original brief/purpose: Public Secondary Girls’ School. 2.3 Architectural and other designers: Norman Seabrook (1905-1979). 2.4 Alan Fildes (1909-1956) was the building superintendent and later became a partner to Seabrook, establishing the practice of Seabrook and Fildes. 1954: a caretaker’s residence was erected on the flat roof of the east wing as well as a prominent mural to the entry foyer and double glazing introduced to the east wall windows. 1961: a new balcony was added to the assembly hall designed by Leith & Bartlett as well as a new access staircase and extra classrooms including a music room. This extension was made sensitively to match the original fabric in both its materiality and language. 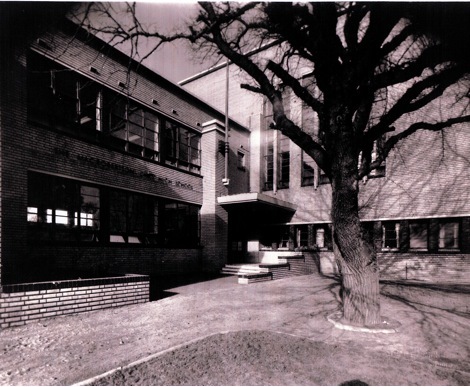 1970: A new senior library was built which greatly altered the appearance of the building. This extended from the original rooftop library around the top of the north wing to meet the assembly hall. Again, this extension was made sympathetically, adopting similar detailing and character but the overall composition of the building was adversely affected. 1978: The science laboratories were refitted and repainted, curtains added to the windows of the assembly hall and the original ‘schoolhouse’ light fittings were changed. palette with its cream brick forms, red steel framed hopper windows and deep blue glazed tiles. Internally, its colours are softer, employing shades of red, blue, yellow, black and green. 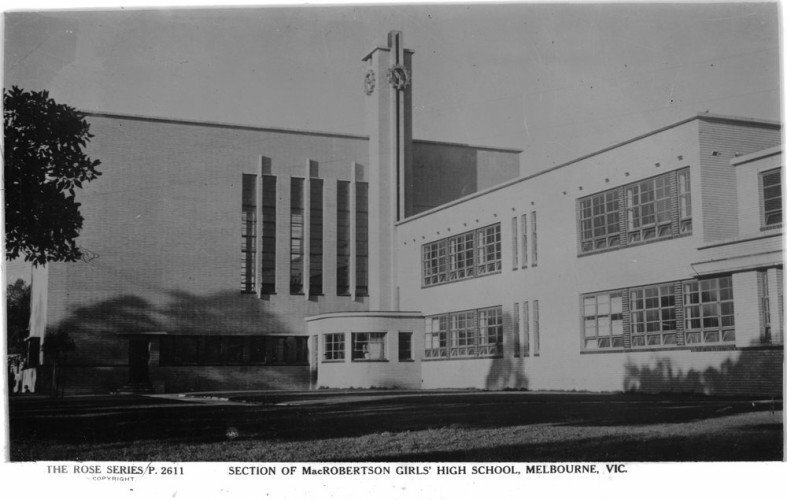 The school’s functionalist plan was a radical departure from previous Australian school designs. It rejected a Palladian plan type, popular with contemporary Australian school designs, instead embracing a Modernist strategy of zoning the various functions into four main branches, grouping the class rooms, science rooms, art rooms and cookery rooms into clearly defined sections. 3.3 The building was constructed on a large site within the Albert Park reserve in Melbourne’s inner 22 south. steel tubular chairs. The school also incorporated a sophisticated clock system, designed by Seabrook in conjunction with a local clock maker, which consisted of thirty-six clocks throughout the classrooms and the main hall. Robertson. It was officially opened by the Duke of Gloucestor on 7 November 1934, as part of the state’s centenary celebrations. 4.5 general assessment : The building is an important example of Australian Modernist architecture.